McNeils Auto Care is an independently owned business that delivers honest and professional automotive repair and maintenance services. Our highly trained ASE Master Technicians employ today’s latest automotive technology and are equipped to handle major and minor repairs on domestic and import cars, vans, SUVs and light trucks. 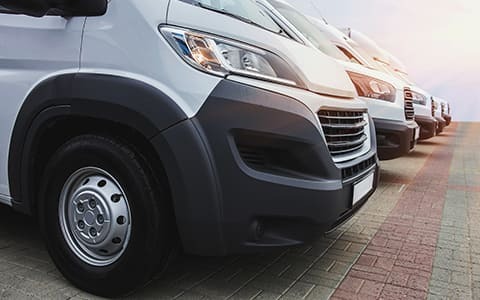 We are one of the only fleet service providers in the Salt Lake valley that have GPS trackers installed so we can provide you the quickest service possible. "We have a 42 truck and van fleet. McNeil’s Auto Care has been taking care of all our repair and maintenance auto needs, from small to major repairs, and tire service. Their pickup and delivery service is great. It saves time and money on my end. Troy at McNeil’s takes care of me as if I’m his only customer. I would like to thank Troy and staff at McNeils for their great service. I would recommend McNeil’s Auto Care to anyone. " “I own a used Car Dealership in Draper, in all my experience dealing with auto care facilities; McNeils is hands down the best I have dealt with. They are extremely thorough with follow-through and their estimated time lines. Their efficiencies don’t go un-noticed! McNeils shuttle service is a great help with my timing needs by picking up and delivering vehicles. The customer service and communication you and your staff provide to us is undisputable, the best we’ve had. I am confident with McNeil’s our vehicles are being maintained properly and ensure the safety of our customers. 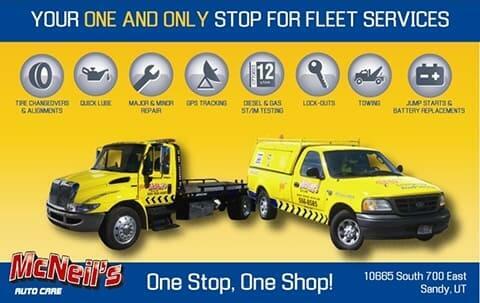 McNeil’s provides superior service and even picks up our vehicles for maintenance. Are you interested in finding out more information? Download the Fleet Packet Contact Us directly.